Read what other people are saying about Thom's music! Singles Now Available for Download! 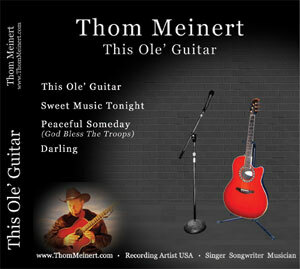 Thom Meinert is proud to announce his two new singles are available for Download! "This Ole’ Guitar" and "Sweet Music Tonight". Thom's first song "Darling", and his #1 hit* "Peaceful Someday" are also available for download! Click any of the links below to listen to a short preview of any song, or simply click on the "Download" button to own your copy of these great songs, only 99¢ each. Purchase a "hard copy" of Thom's 4 song debut album "This Ole' Guitar" for only $10.00. This includes shipping the cd right to your home. Just click the "Buy Now" button to pay through Paypal. Download Peaceful Someday for free! * Peaceful Someday was #1 12 weeks on Sonriseradio.com and continues to climb.